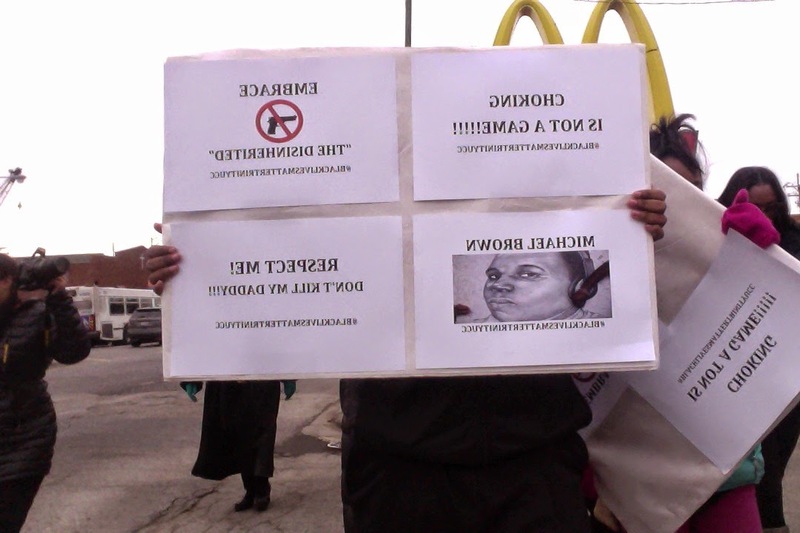 Trinity United Church of Christ Chicago celebrated its 53rd Anniversary on Sunday, December 7, 2014 with a peaceful solidarity protest #BlackLivesMatter lead by our Pastor, Rev. Otis Moss III and his wife First Lady Monica Moss. We chanted and marched from the church down 95th Street to the Red Line Train Station. TUCC was one of several churches to protest on this Sunday in wake of the Eric Garner non- indictment of the police officer who choked him to death in New York City. and the shooting death of Michael Brown in Ferguson, Mo. by a police officer who was also not indicted by a grand jury. I have been sharing on social media the videos, photos and articles since August of this year when the Ferguson police attempted to blackout the media by shooting at their camera equipment and damaging their battery pack. The Ferguson Police did not want the story to get out about their attack on the Ferguson Canfield Residents where Mike Brown who was unarmed was shoot by a police officer. The police allowed Mike Brown's body to lie on the ground for 4.5 hours in view of the Canfield Residents. It was subtle signal to the residents that this could be you. The members of TUCC Chicago lead Rev. Otis Moss III and his wife First Lady Monica Moss participated in a die-in at the 95th Street Red Line Station for 4.5 minutes to represent the 4.5 hours that Mike Brown laid on the ground after his death. Peaceful protest begin in Ferguson with residents chanting "Hand Up Don't Shoot" which symbolizes Mike Brown's surrender to the police as he was shot to death by the police officer. We also chanted "Black Lives Matter" which is a statement demanding that White America recognize that the lives of Black People are not equally valued in the United States of America. Pastor Otis Moss III lead the hundreds of church members who participated in the peaceful protest in prayer and the youth spoke about the number of Black lives that are lost every hour to police shootings. My thoughts are that Black Lives Matter because we are all God's children. The color of our skin should not be a death warrant in America. Black people deserve education and jobs. We live in Chicago, a city in which our Mayor Rahm Emmanuel closed 50 schools effecting 10,000 students many who fear going to school. This past summer 96% of Black youth ages 16 to 24 years old were unemployed, the lack of education and jobs are also hurting us. We protest for a better future for our youth just as we protested in the 1960's. America has broken its promises once again of civil rights, the civil rights act was temporary it was not a law. America has taken back out civil rights. During the 1960's Dr. Martin Luther King Jr. lead a March on Washington and lead marches around cities in America to fight for education, jobs, housing and equality. White America has turned its back on those promises. Today White America refuses to fund education for Black People through the tax laws. White America closes our schools and builds jail cells based on the number of black and brown students who can not read in the third grade. The prisons are the new slave plantations with new chains taking away our freedom. Once the protests have stopped will the same thing happen again? Will the 1964 Civil Rights Act become a law? Will White America change the tax laws to fund the education of African American and Latino children? Will the building and funding of prisons instead of schools stop? Will the killing by police of our black bodies stop? Will White America cure itself of the mental illness of racism and truly make Black Lives Matter? Celebrate President Barack Obama's Inauguration with Local Brunch in Washington D.C.